They must wait two years for "big magical chest" to open again. Mulgrew calls crowd to order, welcomes us. Asks new delegates to stand. Applause.Mulgrew says we’re all in it together. Says going into education not an easy thing these days, that you have to be crazy to be a unionist. Thanks new delegates again. Mulgrew thanks those of us who wore pink. Says UFT single largest organizer for Strides, speaks of people walking this Sunday. Mulgrew gives a brief lecture on democracy. Says it doesn’t matter if people agree with him and we will follow Robert’s Rules. Says we are conduits of information to members. Says it’s important we get a group to help and support us. Says CLs asked for union to support chapters and DA agreed. Mulgrew warns report will be long. Says every year there is crisis. Since he’s been president, all there is is crisis. But we never panic, we are smart and strategic and that’s what we do. Mulgrew praises Democratic debate for being substantive. Says we know of people trying to destroy middle class and we are at war with them. Says this viewpoint was previously deemed crazy. Speaks of pharma benefits under great scrutiny, but unless pharma companies are put in check, this will be a problem. Speaks of hedgefunders buying patents and price-gouging. Mulgrew was in Albany, says Janella Hinds testified against notion of receivership. Mulgrew glad that schools in NYC get extra money and support. Mulgrew says state has adopted a Bloomberg plan. Bloomberg originally wanted to close 16 schools, closed many more, and failed to improve them. Mulgrew says we can work with difficult students if we have the right support, but can’t do so when we are constantly under attack. Says it’s wrong to judge teachers and schools by test scores. Mulgrew says if we don’t agree tests are only measure of student learning, then schools that do well on tests are not necessarily doing well. Says teachers in challenged schools doing hardest work in the nation. Says law says SED will review Common Core Standards, and governor signed it into law. It is therefore odd that Governor is forming his own commission. Says we are participating in both commissions, but that they will both come to same conclusions. Says they can be developmentally appropriate and not scaffolded correctly. Mulgrew says we need a two year commitment from state to develop standards for IEP and L students. Says if you make a child sit for a test based on their chronological age when it’s not appropriate, it is child abuse. Says it’s the same for kids who do not speak a word of English. Says SED will place a review of CCSS on line. Says he’s worried people will write inappropriate things and they will be used against us. Says comments should be professional, and free of four-letter words. Says he doesn’t want to deal with the “crazy nudniks” in the media. Says he will let us know when SED goes live. Says there’s a lot of info but he usually likes to stand there and crack jokes. Says there is a whole lot of room inside of regulations that are very important to us. State must adopt emergency regulations as they contemplate final regs. Says Board of Regents wanted to make emergency regs final, but we do not agree, We want changes, to with, teacher privacy law. Says regs would have undone it, but it was put back into effect. Says we fought for teacher growth scores during entire session, that there will always be outliers. Students at top and bottom may show no growth. Recalls NY Post citing worst teacher. Says she taught low level non-English speaking students. Says state needs to deal with that right now. Mulgrew says there are other smaller changes, but we don’t have everything we want. Says there is a 30 day review period and we are in midst. Says there will be others. Says 100 teachers have been officially designated outliers. We don’t know who they are, as per privacy law. We are required to negotiate new evaluation system by November 15th. If we don’t agree, we may ask for waiver. We are negotiating with DOE as per law, and will continue to do what is required. Mulgrew says there will be battles. Says debate gave him hope because they discussed small group of people trying to do bad things. Speaks of threats under Bloomberg. Cites 4000% increase in legal bills under Bloomberg. Says in the end, Bloomberg knew we won as he had 20% approval rating in education. Says he hated us more than anyone. Says Fariña had to undo many things he did, and that Bloomberg signed many contracts to ensure there was no city surplus. Bloomberg then said there could be no retro pay for city workers, but then specifically cited no retro for teachers. Says we now have better friends in the community than ever before. Mulgrew says retro is not an entitlement, no guarantee we can get it. Says he sat down for days and days and days. Says city realized what Bloomberg had done. Says he tried to privatize many different services in many different agencies. Says what Bloomberg did was unconscionable and our coming to an agreement showed him. Says the city didn’t have the money. Says those of us who’ve never been in a negotiation need to know that everything we do has a dollar sign on it. Says there were things we could not get that we wanted. Says we wanted and got more voice for educators, and it’s surprising with our huge financial package. Says this week that part of this agreement starts to become real. Says everyone said we would never get it, but tomorrow and Friday we get first installment. Moderate applause. Says editorial said it couldn’t be done. Says we got through a war, Bloomberg thought he would get last laugh, but it’s not a guarantee, there’s no entitlement to retroactivity, and that you have to work hard. Says we tried to collapse it, but “we made sure that everybody’s gonna get made whole.” Says this has never been done before, and no one’s ever done anything on this scale. Says not to advise anyone on individual retro packages, that every person’s is different. Says there are UFT experts who can advise. Says city wanted no one at leave to get retro. Says city wanted continuous employment. Mulgrew says all contributions and deductions are included in retro including TDA and dues. Mulgrew says if you are giving 10% of your salary your retro raises your salary and you will contribute more to TDA. Says we like that. Says this money is all pensionable. Question he hears the most is about individual calculations. Says it is a compound growth formula. Says 4% 09, 4% 10, but every day you have 8% more in your workday. Since it’s stretched out, that number continues to grow. Says next 12.5% will have grown and will be higher. Says it gets more complicated, as per session or longevity compounds. Says every little change moves it up. Says it will continue to go up until fully phased in in 2018. Says this is why we can’t answer individual questions. Says to stress compound growth agreement with members. Says only UFT specialists can calculate, and that there is an inquiry form online. Says oversized classes are down dramatically this year. Says despite all ugliness in Albany last year, we got more money. Says we need Contract for Excellence because it will lower class size. 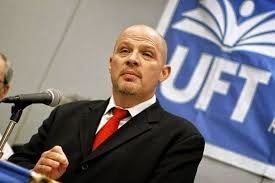 Says we have almost 6,000 new working UFT members. Expects press conference about class size to encourage CFE funding. Explains courts said, on CFE, NYC and other districts are being underfunded unfairly by state, and suggested funding based on need. Says state owes us 3 billions. Says parents need to understand they’ve been shortchanged. Says Bloomberg spent all the money on lawyers, but CFE was stopped when economy collapsed. Says we will try to fix it via court or legislation. Says it’s important we can show we lowered class sizes with influx of money. Says we have same amount of re-org grievances but 50% are already resolved. Says we can use arbitration and grievance processes for other things now. Says chancellor said when principals were wrong, things needed to be fixed for teachers. Says this is in contrast to Joel Klein’s approach. Mulgrew wants 80% retention. Says we’ve already done these programs. Says we need committees to help them. Asks who needs help helping them. Mulgrew speaks of being a new teacher and how difficult it was. Says he taught in a storage closet, had to empty it. Mulgrew says the partial weeks have not helped. Says we’ve already had teachers who’ve left. Says he respects them for recognizing how tough this job is, but the folks who stay need help. Says UFT will have events for them, and that we should send their info so UFT can make database. Urges us to send DR all contact info. Mulgrew announces Met game is over. Goes into various jokes and stories, Lectures Emil about something. Chapter building discussion concludes. Says any DA member can take classes. Says it starts in November. Says money we saved in lawsuits will fund classes. Says we’re always trying to help our members. Says national coalition of NEA, AFT and someone are up against Rhee Kochs, Bloomberg and Moskwoitz. Says everything goes back to education in the classroom, and you never know if you’re gonna get a better class. Says we are regularly attacked, but we’ve gotten through Bloomberg and will get through Moskowitz. Says we knew she’d have the commercial deeming us failing. Says bad guys will never go away and we have to deal with her. Says we will celebrate our schools and that we do great work, Says we will be at war with Moskowitz, but other villains have disappeared. Says they have shifted money and resources into LA. Speaks of Chicago where members are fired after 3 months it schools closed. Says our Gov, may avoid education but we will urge funding based on need. Says NY state only one where affluent kids get more funding than needy ones. Bloomberg portrayed on screens. Mulgrew says enough said. Screen shows pic of Cathie Black and Joel Klein. Says bad guys don’t go away. Says they always have a plan. Says people thought he was nuts when he used to say a small group was trying to ruin us. Says they were pushing school closings, merit pay, were snake oil salesmen. Says we pushed back hard so they tried to change laws. Says they caused economic downfall and then wanted to change laws, as in LIFO. Says they wanted 50% test scores minimum. Says they had political momentum behind them. Says our job is to organize and strategize how to push these people back. Says we’ve changed political climate and people understand education reform has failed and their ideas do not work. Says it was about destabilizing unions. Says they killed private sector unions and are now after us as largest public sector. Big battle now is getting rid of us. Says best way to deal with Moskowtiz is to celebrate schools. Says we will base resources on poverty and need. Says we are largest school system with most diverse needs and we celebrate that. Mulgrew calls it Hail Mary pass by those who hate us. Says legally is small group of teachers from CA. Ten teachers now have millions and best law firms in US to carry their case. They will render every state in US right to work if they win. Says it’s about small group of people determined to kill middle class to collect more money for themselves. Only organized labor has been able to stand up to them. Says they own politics, and that corporations are now deemed private citizens, unless you sue them. Says they believe they have court where they need it right now. They agreed to lose political process in CA so they could get it on SCOTUS docket this session, before anyone leaves or dies. Mulgrew says no one has to be UFT member. Saying otherwise is not true. You can be an agency fee payer. Was determined by SCOTUS in 70s that unions that provide services have right to collect fees. Says it is effort to bankrupt unions. Says they are trying to take away the last piece that stood up to them. Says decision will come during school year, and that decision hinges on one judge on fence. He says it’s Scalia. He says Scalia seems to agree with Aboud. Says it was 9-0 decision and SCOTUS doesn’t reverse 9-0 decisions. Says they know if we have to spend all our time organizing and collecting we cannot be active against them. Says we will start an informational campaign about what this is about. Says almost all of our political money is via COPE. Says first people we have to educate will be members. Says most schools he’s visited are uninformed on this. Says UFT will get a packet out, and we will follow by educating public. Says it dovetails with what he heard on debate. Says union doesn’t just do one thing, and we therefore have to celebrate our schools. Asks us to remember to do that. Mulgrew shows commercial at 5:42 PM. Gets applause. Asks if we do a damn good job, repeatedly. Gets loud positive response. Says you may request the bus in commercial, and wants parents and students around if it comes. Mulgrew apologizes for going long. Leroy Barr talks, and Mulgrew promises a shorter message next month. CL IS 52—Superintendent mandating online record keeping. Is that kosher? Mulgrew says no. Question—why does dental plan copay go up every year? Question—are D75 teachers on panels? Speaks of child abuse on testing. Speaks of high-needs children and their needs. Mulgrew thanks her for question. Says they are included in UFT working groups. Says her kids are tested because of federal law Says feds decided this was necessary unless there was alternate assessment. Says fed thinks IEP suggests kids can perform at chronological age, and calls that crazy. Says feds must remove mandates. Says there may be path in next year to do that, and that GOP and Dems agree. Question—Is there a way for us as members to express disgust with John King appointment? Mulgrew says do what you like in your private time. Says state came up with plan to eliminate layoffs. Says they were going to train everyone in CCSS and then do testing and compile data. Says they never designed curriculum, trained no one, and developed data system. Then they developed an evaluation system. Says rollout in NYS was a debacle. Says data system that they spent on is garbage, and that person who initiated this is now US Sec. of Education. Sean Ahern—Rikers Island—says people got highly effective ratings based on two students who passed Regents exams. Mulgrew says it sounds funny but he’s right. Ahern—Students come, are there for 40 days, whole system is crazy, but shouldn’t Rikers teachers be outliers? Mulgrew—God bless work you do, all your students are transient, when fight occurs placed is locked down. Says this should be taken out. Says project based portfolio learning much more valid. Says people assume worst about us. CL—Is there a way to work into ads and PR about all work union does to advocate for students getting their services? Says he’s the one who fights for kids. Applause. Says union interest intertwined with student interest. Mulgrew agrees. Says he appreciates comment. Says it’s insulting when you’re in a dispute with someone who doesn’t want to pay for needed services. Says we should use social media in a big way to say this. Says he doesn’t like DN but participates in Hometown Heroes. Says teachers honored say their peers do same all year round. Mulgrew says we are officially out of time. 6:02. Says body can decide to extend. Asks for motion. Dave Pecoraro moves to extend for motion period. Mulgrew says for ten minutes. Is seconded. Mulgrew calls second vote, and extends motion period. Jia Lee—interrupted as Mulgrew explains procedure. Mary Ahern—wants to know why we need two thirds for this month, cites Robert’s Rules. Parliamentarian—says meeting run by Robert’s, but constitution says meeting will only discuss matters for which it was convened. Therefore rules must be suspended. Mulgrew calls for cheer for parliamentarian. Jia Lee—proposes for next month. Says has to do with retro pay. Mulgrew says everyone must have copy. Mulgrew asks who needs it. Jia—thanks Mulgrew for health and other benefits, says members with health issues need retro pay and we need to consider them. Cites members in economic stress. Says we should stand in solidarity and there is a way to help them. Says we could get DOE to help. Says city has 5.9 billion dollar surplus. Urges low interest loan so members on leave can get retro pay. Point of information—CL asks if this is proper. Questions political ad on back of flyer. Says there’s no “union bug” on paper. Mulgrew calls for speaker against, and then vote. Delegate, PS 164—Queens Maternity Liaison for UFT, does workshops—speaks against. Says there was appreciation for hard work. Says you have to be on payroll to receive retro and they will be made whole. Says when big magical chest opens it will be closed for two years, but will still be there for you next rollout. Says everyone will be made whole. Says maternity leave is just a six or eight week absence. Says it’s a choice. Says for us to endorse loans, that’s a personal decision. Boos ensue—Mulgrew says we’re going to be respectful. Speaker says you must consider things when you take a child care leave. Says asking union to be involved with loans when it made arrangements for them to get money…says vagueness of how much money is problem..says that they will be made whole is important and union ought not to participate. Mulgrew says we figure out how to do the things we do for members in distress. Says this bothers him a lot. Says he hopes next time we won’t need retro and wants fair maternity leaves for members. Mulgrew says thank you and calls for raffle.